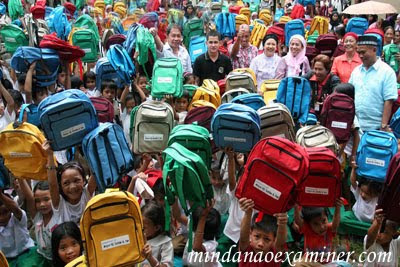 Thousands of Muslim students receive new bags and school supplies on two-days of humanitarian mission on a coastal town of Maimbung in the southern Philippine province of Sulu. 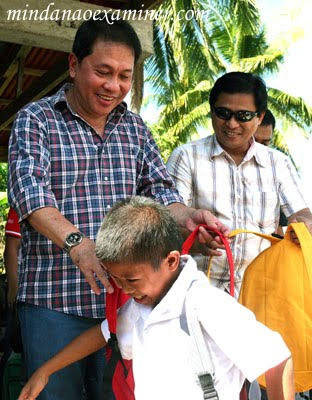 Governor Sakur Tan and his son, Samier Tan, the mayor of Maimbung town, and wife, Nurunisah Tan, led the First Family in the distribution of some 10,000 bags, notebooks and pad papers to throngs of students in different schools from 27 villages. 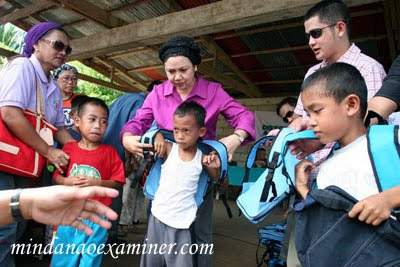 (Mindanao Examiner Photo - Jung Francisco). 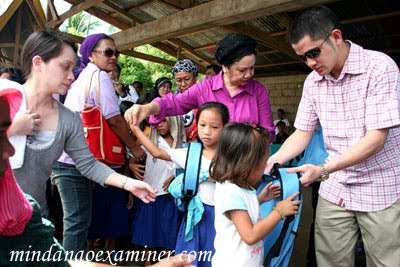 SULU, Philippines (Mindanao Examiner / July 21, 2010) – Thousands of Muslim students received new bags and school supplies on two-days of humanitarian mission on a coastal town in the southern Philippine province of Sulu. 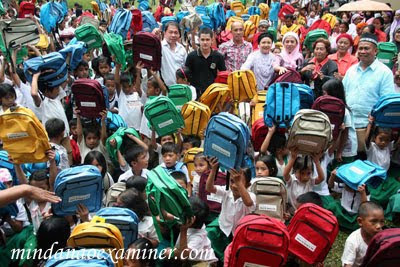 Governor Sakur Tan and wife Hajja Nurinisah Tan, and son, Samier Tan, the mayor of Maimbung town, led the First Family in the distribution of some 10,000 bags, notebooks and pad papers to throngs of students in different schools. 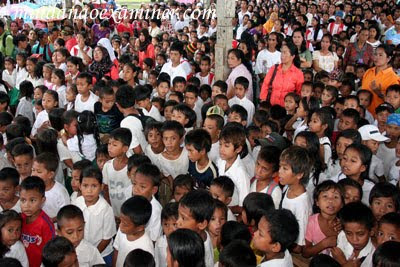 The young Tan said he would distribute more bags and other school supplies to students in the town and would prioritize livelihood projects and health care to the locals, mostly fishermen; including the minority Badjao natives. The governor’s wife, herself a professional nurse, and daughter Sheila Hayudini; Dr Farah Omar, of the Integrated Provincial Health Office and the Department of Health, also gave out Vitamin A and deworming medicines to school children in five areas where the humanitarian missions were held. 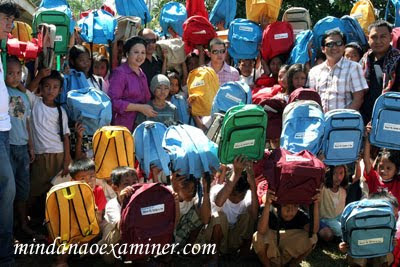 The two-day event ended on Tuesday, but more bags had been distributed on Wednesday. “This is just the beginning of more humanitarian missions not only in Maimbung, but in other towns in Sulu as well, just as what we did the last years. This program will continue and we will reach out to more people in far-flung areas,” the governor, a known philanthropist in the southern Philippines, said. Tan also ordered his engineers to inspect the state of various schools, mostly built from old buildings, in the town and come up with recommendations on how to improve its condition or whether the structure is still safe. The governor previously built a new school in the town and is now planning to put up a university in Maimbing which will specialize in fisheries and agriculture. “We want this university open to all and everything will be free, from tuition to books, and we shall lead our students to become professional and experts in the fields of fisheries and agriculture because Sulu is rich in natural resources and we have vast marine resources,” he said. On Saturday, dozens of Islamic students will also graduate from a madrasah that the Tans built in the capital town of Jolo where the governor’s wife also put up a children’s playground and a mosque. And a waiting shed to spare school children from the sweltering heat of the sun or cold rain.